This post is part of a series that that will highlight some of the interesting provenance cases in the Milwaukee Art Museum’s Collection. Last time we looked at The Marriage Trap’s provenance and attribution just before and since its acquisition by the Milwaukee Art Museum. That’s usually the easiest part. 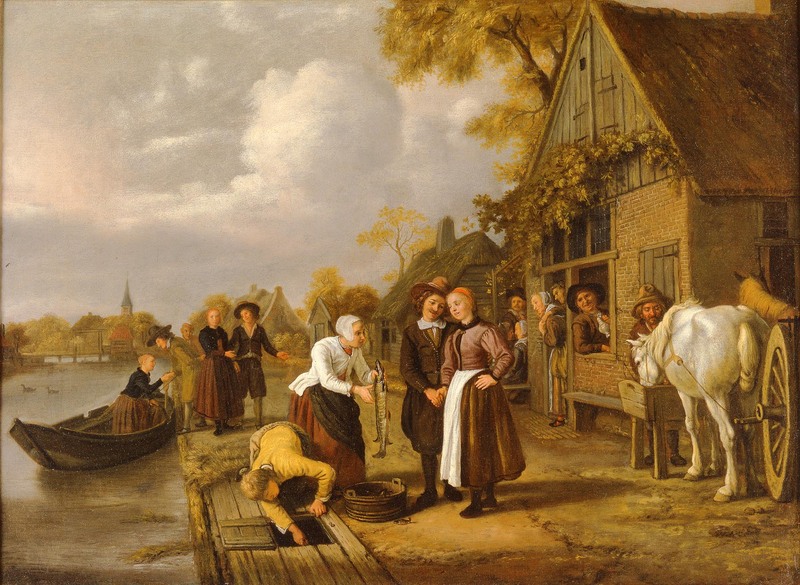 In this post, we’ll see how piecing together the ownership of a painting requires pulling information from a number of sources, thinking critically about what we find, and then sometimes making an educated guess (noted as such, of course). Each work of art in a museum has an object file kept by a registrar, which houses any information, documents, and ephemera related to the artwork. In the object file for The Marriage Trap, there is a photocopy of the entry for our painting in Werner Sumowski’s Gemälde der Rembrandt-Schüler (Paintings of the Rembrandt School)–the important reference that I mentioned in my last post. Sumowski writes: “Herkunft: Verst. V. Mautner-Marhof, Wien 27.11.1927, Nr. 58 m. Abb: J. Ochtervelt”. Whoa! That’s not only in German, but is full of abbreviations. What does it all mean? “Herkunft” is the German work for provenance. Aha! So what’s after that must be related to the history of ownership. “Verst.” is short for versteigert, which means “sold at auction”. “V. Mautner-Marhof, Wien, 21.11.1927” is the name, location and date of that auction. 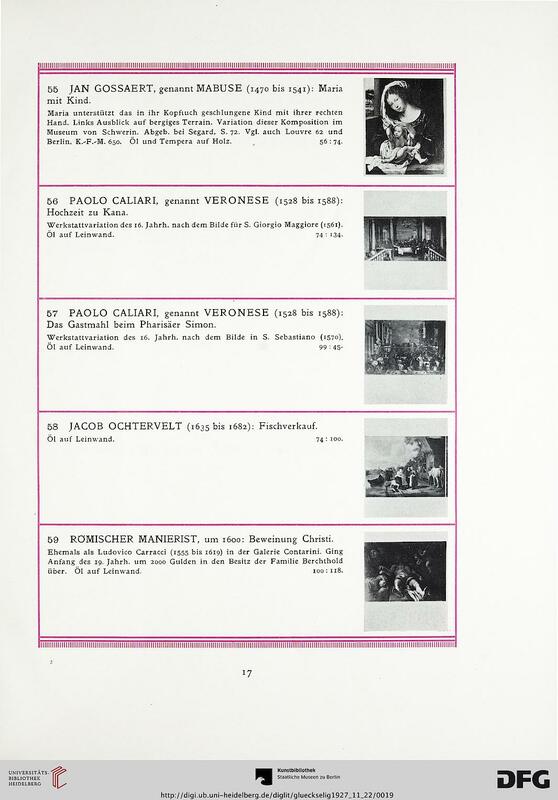 So the sale was called V. Mautner-Marhof, took place in Vienna, and was held on November 21, 1927 (remember in Europe, the date proceeds the month in numerical notation). “Nr. 58” is the item number in that sale (known as a lot number). “m. Abb” is short for “mit Abbildung”, which is German for “with reproduction”—so we know that the painting was pictured in the auction catalogue. “J. Ochtervelt” is probably a name, maybe the name of the artist given when it was sold. To find the catalogue for the auction, my next stop is one of the best sites for research: WorldCat.org. Libraries around the world upload their collection catalogues to this site so you can find almost anything—including a copy of that auction catalogue from November 21, 1927! The only two copies of the auction catalogue are available in the United States are held by the Philadelphia Museum of Art and the Frick Art Library in New York. Not convenient for someone in Milwaukee! But sometimes there is more than one entry in WorldCat for the same book, and I found out that the Heidelberg University Library in Germany also has a copy. I also knew, from previous searches, that Heidelberg has scanned many of their resources so that you can view them online. Maybe this one was available digitally. So I went to the Heidelberg’s library website and found out that yes, it was! And on page 17 of that catalogue, number 58 is a listing for our painting. There is no doubt because the painting was reproduced. Page 17 of Nachlass Viktor und Helene Mautner-Markhof: Mobiliar, Gemälde und Ziergegenstände der Neuzeit. Image courtesy of Heidelberg University Library. As I suspected when reading the Sumowski entry, when the painting sold in 1927, it was attributed to Jacob Ochtervelt (1635-1682), a 17th century Dutch painter of the Italian school. He focused on genre paintings, but his subject was interiors, not markets. Just compare The Marriage Trap to The Love Letter at the Metropolitan Museum of Art below. You can see that the style is more refined than Victor’s, and the figures much longer and elegant. The activity is limited and the scene simply evoked. Jacob Ochtervelt (Dutch, 1634–1682), The Love Letter, early 1670s. Oil on canvas. The Metrpolitan Museum of Art, Gift of Mr. and Mrs. Walter Mendelsohn, 1980. So, now I knew that the painting was at one time in the collection of Viktor and Helene Mautner-Markhof. The latest that it entered that collection is 1926 (when Helene died). Since the collection is under both of their names, however, it is probable that the painting was purchased before Viktor died in 1919. But I don’t know that for sure, so I just document what we can be positive about for now. And, although we know that the painting sold in 1927, we don’t know who bought it. Sometimes you can find an annotated copy of auction catalogue in a library that lists the purchaser. Unfortunately, we have checked the other known copies, and none of them are annotated. So, for now, that’s a dead end. Next time we’ll look into at least one stop the painting made between the Mautner-Markhofs and the Flaggs: Nazi-era Germany. This entry was posted in Art, Behind the Scenes, Curatorial and tagged Dutch art, jan victors, provenance. Bookmark the permalink. Great posts about provenance research! Regarding the Frick Library: did you know that they will conduct research for you, on one question per week, at no charge? If you know the auction catalogue you need (or think might be the one you need), they will look up the listing, photocopy the relevant page(s) for you, and mail them to you, all free. It’s been a huge boon to my provenance research, since we don’t have collections of their caliber where I live (in Oregon). Jody Seasonwein, Senior Curator of Western Art, Jordan Schnitzer Museum of Art.